Happy Halloween! I’m in the mood for an extra, and I’ve got some stuff that’s been turning to zombies from the tipline. 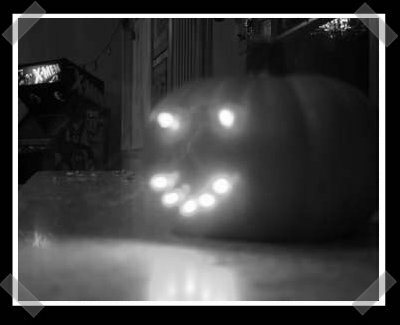 Pictured above is a nice simple LED pumpkin sent in by [John]- perfect for the hacker with less than stellar art skills. Let’s not forget [mastershake]s Hack-A-Day pumpkin from last year. Where’s the THAD pumpkin you promised? [Wolfgang] sent in these mini pumpkin bots – they look like toys, but they’re made from XBox parts and radio control cars. [Brandon] built a budget (~$150) guitar hero controller out of a Gibson Epoch guitar from target. This scanner cam has been around for a while, but I admire how he keeps fine tuning and tweaking the design. Thanks to [Loopymind] for passing it along. I keep getting emails telling me that Google Earth has a flight simulator. Yes. We all know about it. Is “budget” really the right word when it costs 50% more than the controller + game bundle? $150.00 for a incredibly crappy looking hacked up guitar hero controller? Oh my GOD! I’m gonna take an axe to a set of drums and put a casio keyboard in the kick, can I get featured on hack a day? how about a guitar hero real guitar hack that actually looks good and works 100%? Regarding the scancam, I wonder if he has figured out yet that white pvc doesn’t block light very well. The scancam is very interesting. I wonder what results would yield from a better scanner and a higher quality lens assembly. @Eldorel: The pvc pipe is 1/4″ thick, no light gets through there. The shroud over the scanner head, though, is much thinner plastic, so that could be a possible source of the problem. I have not investigated the problem further since I posted about it. @goldscott: That is the plan for my next attempt. Get a more reliable scanner and a used SLR camera body and lens to mate to the scanner head. My first attempt used pretty much what I had on hand (except for the lazy susan bearing). I was quite pleased with the results, given the shortcomings. Ted Yapo liked A Programable Breadborad. forthnutter has followed a list. Raphael Sauer liked RC FPV tank rover. Ted Yapo liked Ternary Computing Menagerie. forthnutter has added a new log for WICE-4M. Ted Yapo wrote a reply on FF555. deshipu wrote a comment on FF555. Ted Yapo wrote a reply on project log Back to the beginning: ADCMP606 w/ 120 ps edges.